*REMINDER* – In all locations, containers shall be placed at the curbside by no later than 6:00 am on the day of collection for emptying by the Solid Waste crews. These same containers must be placed back to the edge of the building by no later than 6:00 pm that same day. Christmas Day- (2 days)-12/24/18 -Monday- Normal trash collection- 12/25/18- Tuesday- No trash collection ( Tuesday trash will be collected on Wednesday 12/26/18 ). New Year’s Day- 01/01/19 –Tuesday- No trash collection ( Tuesday trash will be collected on Wednesday 01/02/19 ). A collection Fee is imposed for commercial establishments requiring collection more than five times per week. These establishments will include Hotels, Motels, Condominiums, Apartment/Multi-Family Complexes and Restaurants. This fee structure will be in effect from mid May to mid October. The fee is $100 per additional pickup per site visit regardless of container size. In most cases the five-day collection schedule would exclude Tuesdays & Thursdays. Other days without collection may be possible if arranged in advance with the Solid Waste Manager. We are not in any way going to sacrifice the cleanliness of the Town. Therefore, the Solid Waste Manager shall have the final say on whether a particular location needs seven-day collection service. NOTICE: All trash must be placed at the curbside by 6 AM on the specific dates of collection. Before any metal side load containers are repaired or replaced, please call 410-524-0318 as the Town of Ocean City is in the process of changing over to Front-End and 300-gallon plastic containers. 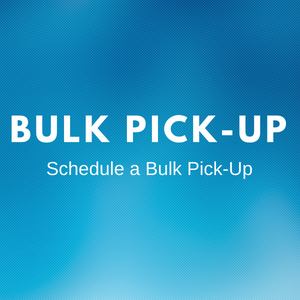 All front-end containers and compactors with enclosures must have doors open for pick-ups. Doors must be opened by the employees of the business and closed after trash pick-up. All doors must have secure holding devices to keep doors open and closed. Compactor lights must be working at all times. (2) Building materials (i.e wood, lumber, carpet/rugs). (3) Hazardous, radioactive or medical wastes. (4) Burning or smoldering materials or any other materials which would create a fire hazard. (5) Rocks, dirt, sod, paint or motor oil. Stolen or other abuse of the carts, which would render them unserviceable will be the responsibility of the owner and a replacement charge will be applicable. 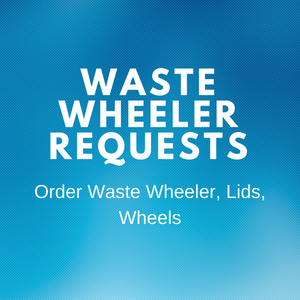 Residents leaving for the winter or leaving for more than a few days, are advised to put the waste wheeler inside or secure outside, to prevent the wind or someone from carting it off. THE PROPERTY OWNER IS RESPONSIBLE FOR THE WASTE WHEELER. All metal dumpsters and plastic containers must be secured from being blown off pads into the streets. Name of the building or address must be on all dumpsters with letters no smaller than 3 inches. Owners must keep dumpsters painted, graffiti free, any wheels greased and clean on the inside.